Philadelphia Union have signed young German left back Kai Wagner, the club announced Wednesday morning. “He is an up-and-coming and very physical left fullback with high ability and even further potential,” said Ernst Tanner in the Union’s press release. Wagner, 21, joins the Union from Würzburger Kickers, a third-division side in Germany. He has two assists in 13 appearances so far this season for Würzburger. Before Würzburger, Wagner played for SSV Ulm 1846 followed by a season with FC Schalke’s reserve team. Left back has been a longtime boogeyman position for the Union ever since trading Jordan Harvey to Vancouver in 2011. The most regular starters since have been converted right back Ray Gaddis and wildly inconsistent Fabinho — the Union’s two longest-tenured players. The position will look very different in 2019, with Gaddis used primarily on the right and Fabinho unlikely to receive regular minutes as he transitions to a reserve/mentor role. Wagner will compete with Union Academy product Matt Real for the starting job, and will likely receive significant playing time if and when Real is called up to the U.S. Under-20 National Team for the U-20 World Cup. Wagner will likely see the pitch for Bethlehem Steel as well. 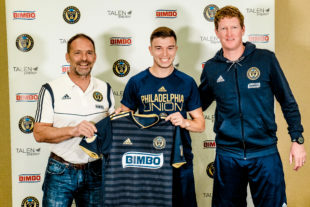 Wagner is one of five Union defenders age 21 and under expected to compete for playing time this season, along with Auston Trusty, Mark McKenzie, Olivier Mbaizo, and Real. Note Tanner’s quote today on how this will not be a traditional fullback role. We’re looking at a wingback… maybe 3-5-2. And at a minimum, he could be someone who can fill in when Real is called up for the U20 national team. It was reported today that Tanner said: “You’ve probably gotten to the knowledge that we are not using wingers anymore. More important is the function of the left fullback, but it is not the classical left fullback who is more from the defensive side. We are calling the left full back on the offensive side a wingback and on the defensive side we are calling it an outside back. He needs to play both roles and that makes it difficult sometimes to get the right player. Doesn’t necessarily mean a 3-5-2, but more that there will be expectations that fullbacks will join in attack. You see this with teams playing 4-3-3 a lot. Liverpool employs it consistently with both fullbacks providing width in attack. Thanks, Pete. That makes more sense given that they have been working on the 4-4-2 diamond. Gaddis won’t be going anywhere after just signing a contract. He has more value in his role as a backup than anything anyone would give you for him anyway. Well it appears that the youth movement is in full swing! I’m good with it. Let’s see how this shakes out! Come on the U! 4-4-2, tight diamond midfield, high pressure. Too few CB’s on the roster for it to be three CBs in the back. And three CBs in the back would negate all the experience Trusty and McKenzie have accumulated since joining the Academy. Thin at left center back in the diamond. Even if they sign Michee Ngalina, still thin. Otherwise, assuming they bring the Marco Fabian deal across the line, they seem set. just hoping that German 3rd Div. =/> MLS 3.0. Fingers crossed that Ernst’s calculus is accurate. He spoke about the physicality of the leagues as being similar. I think that will go a long way. This piece by Jonathan Tannenwald has value on the subject of outside backs/wingbacks. And search Philadelphia Union Sound Cloud to listen for yourselves to what Tanner had to say about him, after her confirms the rumor of contact with Marco Fabian and says he cannot answer any questions about that at this time.